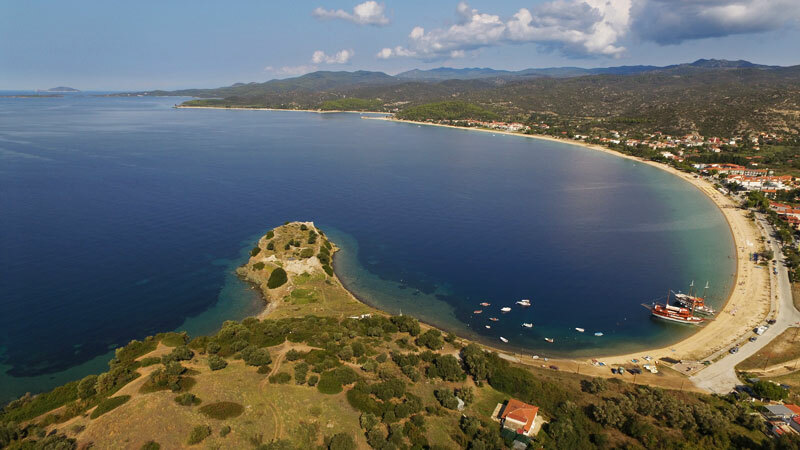 Sitting on the Toroni beach is definitely a sight for sore eyes! Like a living postcard the ancient castle on the cape gives the perfect backdrop and the scene is enhanced with the colorful little fishing boats as they bob up and down as if dancing with the gentle waves. 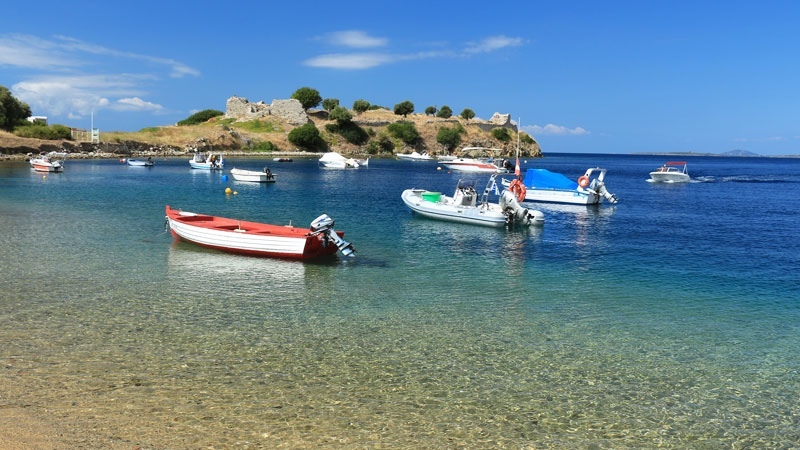 But Toroni is not just another pretty face, this picture perfect harbor with its castle have a story to tell and who doesn’t like a good story! 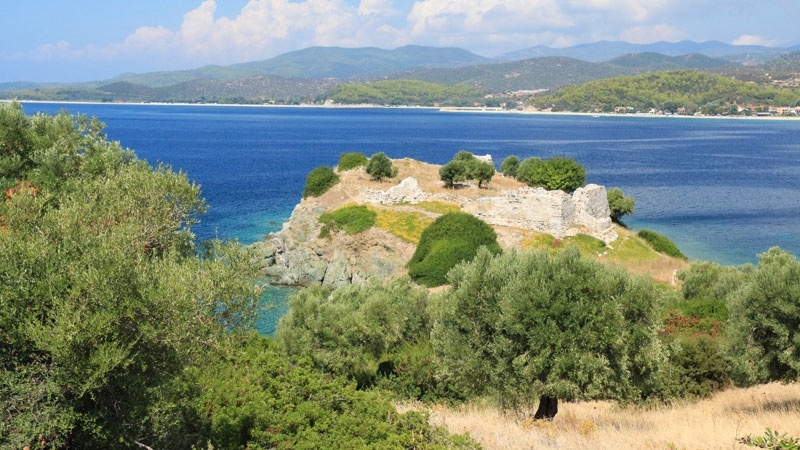 Just to make it clear, Lekythos Castle is no doubt Sithonia’s most important archaeological site. When looking at the meager ruins, who would ever know that this little Byzantine fort is a reminder of a 5000 year history, a turbulant past of a city state that was at one time the envy of the north Aegean. Today, sitting on the beach, who could ever imagine that almost 3000 years ago this same harbor was filled with dozens of anchored ships from Asia and Europe, the jetty occupied with tradesmen speaking different languages as they load their ships with local goods like timber and wine. Let’s for a few minutes turn a light on this city, a product of the Greek Dark Ages that was called Torone. Torone was the name of the ancient city that existed here. It was a rich and important city during the Greek Classical Period and was often caught between the battles of Athens and Sparta. The ruins of Torone are vast and run clear up to the summit of the mountain. 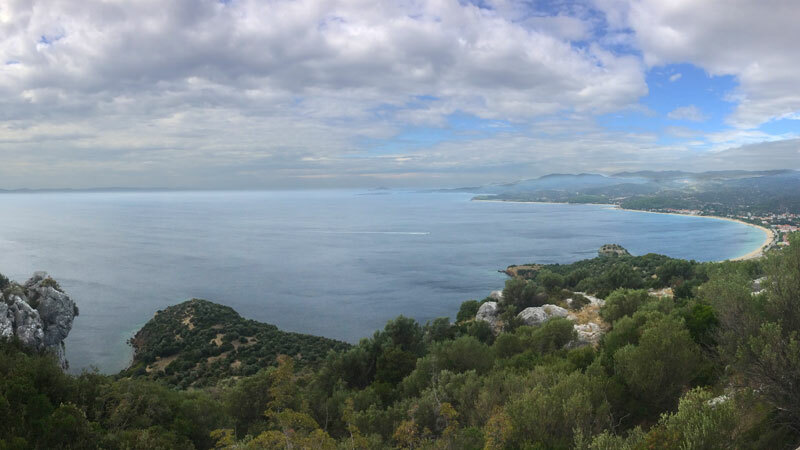 Lekythos is the cape that is at the base of the mountain and forms the harbor today. In Greek the name Lekythos means an oil flask. It’s speculated that the bottle shape of the peninsula was the reason for the name, so Lekythos was not the city itself but the cape. Overtime the Byzantine castle on this cape was called Lekythos castle. Today a visitor to the castle can witness the remains of a few walls that project from the ground to a height of no more than 2-3 meters. The ruins have been under excavation since 1975 and periodically continue. The bottle neck that gives way to the castle is fenced off and the gate usually closed to prevent tourists from climbing on and destroying the ruins. From time to time however, the gate is open and you can see people taking advantage of this opportunity to explore what remains of this ancient civilization. In the Byzantine era the citadel on the cape of Lekythos was fortified by using the materials from the ancient acropolis on the summit. The Byzantine Lekythos castle was eventually destroyed in the 15th or 16th century AD as Torone regressed to become a sleepy backwater. The ruins remained until the last century when the building stones were carried away and used to pave streets in Thessaloniki. The 5th century basilica – Agios Athanasios is another ruin from this era that can be visited today. 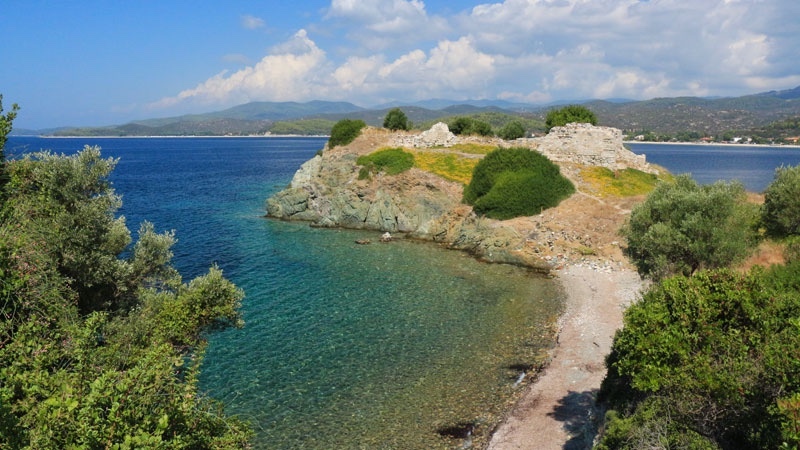 If you get an opportunity to wander the ruins of Lekythos, it would definitely be of interest but this fort is just a small part of Toroni’s ancient history. As already mentioned, the city was extensive as it reached all the way to the summit where an acropolis was located. As you advance on the goat paths towards the summit you pass the foundation stones of the old wall that let from the harbor to the acropolis. An empty water cistern also gives unmistakable evidence of a former ancient settlement. Upon reaching the top of the mountain you will notice how the crest is literally covered with scattered stone building blocks that were once used to build this magnificent city. 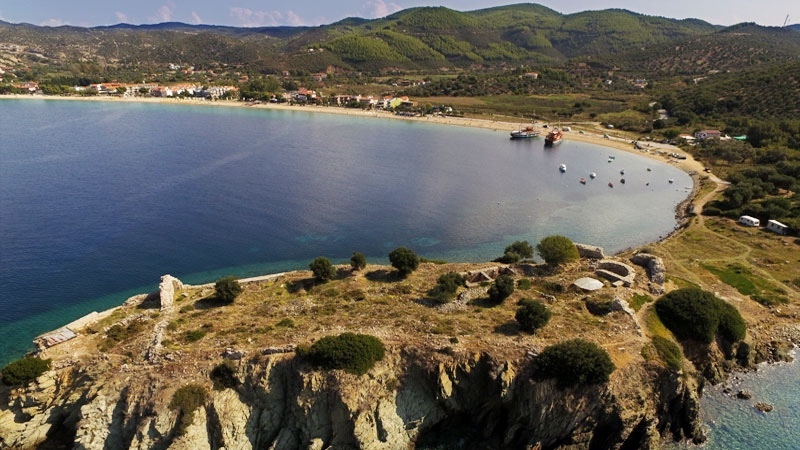 Standing on the summit you will be rewarded with an amazing birds-eye view to the Porto Koufo harbor on one side, the Kassandra peninsula on the other side and even on a clear day you can see all the way to the Sporades islands to the south. A short afternoon excursion is well worth the effort as you reflect what life could have been like in this fortified city almost 3000 years ago. For more details, take look at our Ancient Torone walking tour. Until 2017 archeologists were searching for the lost harbor of Ancient Torone. The harbor was apparently considered its best asset since it was large, protective and strategic. Some speculated that perhaps Porto Koufo was Torone’s harbor but other evidence pointed to the harbor as being elsewhere. The latest investigations have shown that the large floodplain behind the beach could have at one time been a large lagoon that enabled many ships to anchor with good protection. Recent core samples from the floodplain give evidence of a shallow bay that one existed here. 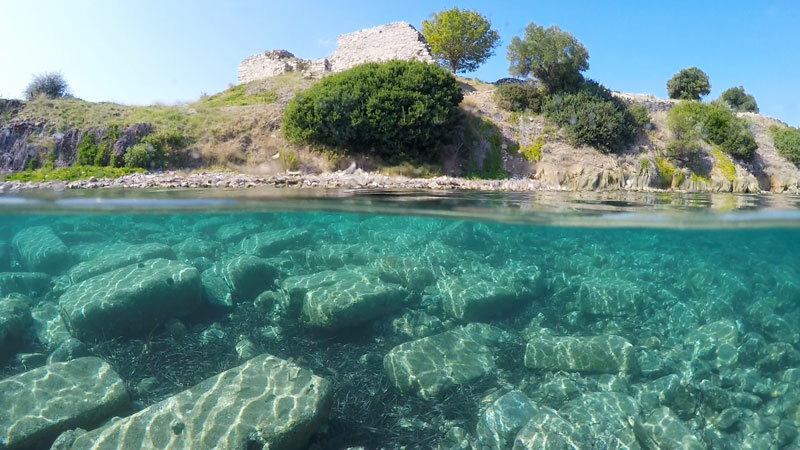 Today, a large part of the ancient Torone ruins are underwater. If you snorkel in the harbor right under the anchored boats, you will easily find one sea wall foundation about 20 meters off the shore and another one about 40 meters off shore. These walls are markers of where perhaps the shore line existed in antiquity. Earthquakes and the rising of sea levels may be the reason why these sea walls are now covered with water. 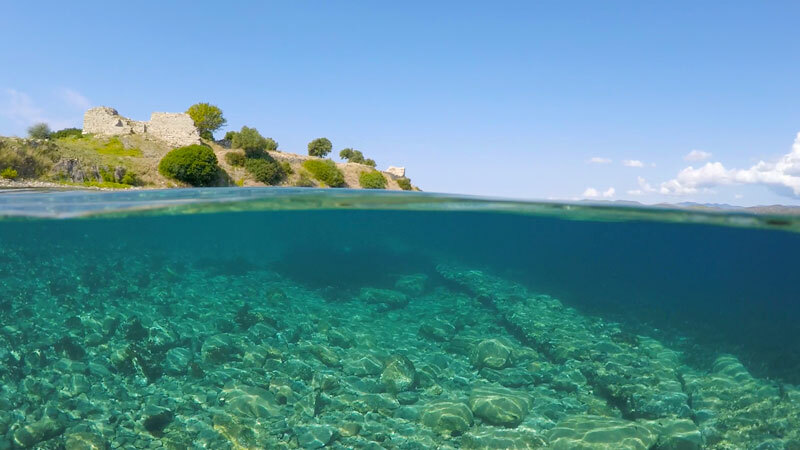 Snorkelling around the cape and into the south bay will reveal many building blocks from the ancient city that were pushed into the sea as the city was destroyed. 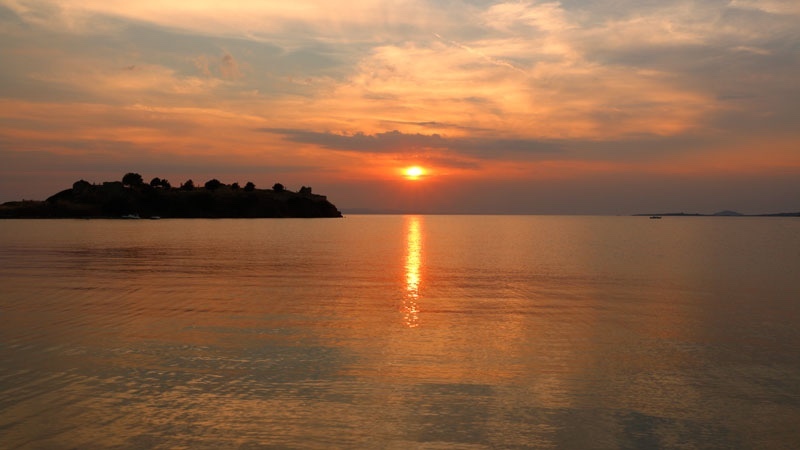 As the sun sets over Lekythos castle, the view is truly magnificent. The silhouette of the ruins and the small fishing boats against an artful display of color is quite symbolic of how the sun set on this once bustling city state. 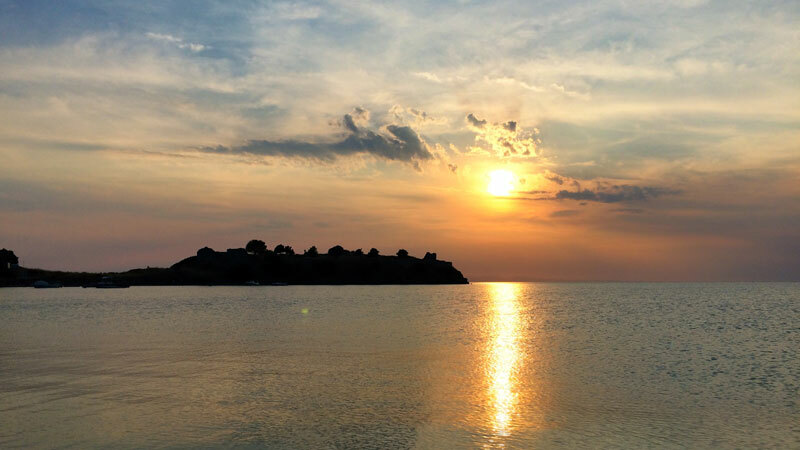 As the sun goes down and the stars come out the lights are turned on and flood Lekythos turning it into a showcase of Toroni’s 5000 year history – just a glimpse of the ancient civilization that not only existed but thrived on the tip of the spectacular Sithonia peninsula.